This article is 1873 days old. 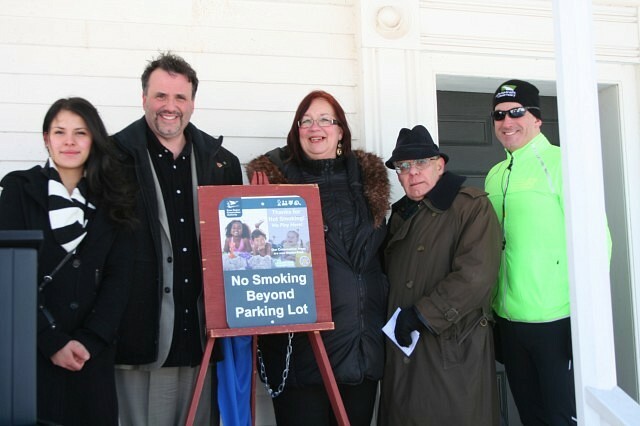 Kimberly Salazar, Chairman Joe Bachetti, Councillor Sue Desjarlais on behalf of the Canadian Cancer Society, Dr. Allen Heimann and Councillor John Scott unveil signage promoting smoke free Conservation Areas. The 2014 operating season will represent Phase One of the Essex Region Conservation Authority new policy to limit smoking in Conservation Areas, and will include Holiday Beach, Hillman Marsh, and the John R. Park Homestead Conservation Areas. Smoking will be restricted to the parking lots at Hillman and the Homestead. At Holiday Beach, due to the size of the Conservation Area, there will be several designated smoking areas. Seasonal campsites and hunting blinds are exempt. The policy will be implemented throughout the balance of ERCA’s 19 publicly accessible Conservation Areas in 2015. Over the coming weeks, signage will be installed at ERCA’s Conservation Areas advising of the policy implementation. “By using a phased approach, administration will be able to advise our Board of Directors of public reaction, compliance issues or concerns, and any budgetary impact,” said Kevin Money, ERCA’s Director of Conservation Services. ERCA is currently working with the Windsor-Essex County Health Unit to develop a program to evaluate the effectiveness of the policy.